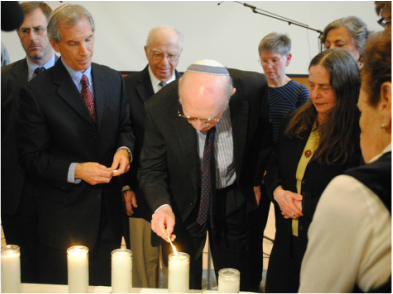 Survivors and their families light candles to open a TMF Yom Hashoah commemoration and concert. ​Dr. Anna Ornstein, survivor and TMF educator, teachs at Clark Middle School in Lexington, Massachusetts (photo at left). Dr. Anna Ornstein teaches at the Winchester Public Schools. World premiere of André Previn's Quintet for Horn and String Quartet, a TMF commission sponsored by The Omer Foundation, at the Prague Spring International Festival. Performed by Jan Viboril, Principal Horn of the Czech Philharmonic, and the Graff Quartet. World premiere of the TMF LiberArte commission by Jiri Gemrot, a setting of TMF-commissioned poems by Jiri Dedecek and Richard Hoffmann, at the Prague Spring International Festival. The Martinu Voices perform. TMF Gala Benefit at Boston's Symphony Hall fetauring pianist Simone Dinnerstein performing the world premiere of "Sanctuary" by Ellis Luddwig-Leone. "Do Not Forget Me," www.tmfgala.orga multi-media concert event telling the stories and presenting performances of the music by five legendary Terezín composers. Symphony Hall, Boston. Renowned poets read their TMF-commissioned works— anthologized in Liberation— at the Massachusetts Poetry Festival. 11:30 am at the Peabody Essex Museum. TMF's annual Tour of Prague and Terezin, an exclusive private journey through the historic, artistic, musical, and cultural sites of Prague, with a guided visit to Terezin. "Memory Unearthed: Music from the Ghettos"
2:00 p.m. at the Museum of Fine Arts, Boston, 450 Huntington Ave. This concert received a glowing review. A concert of works composed and performed in the Lodz, Vilna, and Terezin ghettos, in a program narrated by TMF Executive Director Mark Ludwig. Pianist Virginia Eskin, Boston Symphony Orchestra clarinetist Thomas Martin, mezzo soprano Deborah Rentz-Moore, and cellist Eugene Kim perform. The music and its history will be a powerful complement to the MFA’s exhibit of photographs by Henryk Ross. Join us for the TMF Gala, our annual benefit: a multi-media concert tribute to creativity and survival in Terezín, with renowned artists, Terezín survivors, and the Terezin Legacy Award presented to Khizr Khan. 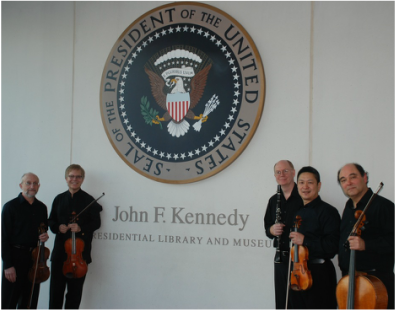 Boston Symphony Orchestra Community Concerts featuring TMF Commissions. At the JFK Presidential Library and Museum. 3:00 pm. Free 1-hour program. At Temple Israel of Boston’s Levi Auditorium, 477 Longwood Ave., Boston. Free parking at Longwood Garage with validation at the T.I. front desk. Survivors and their families are invited to light candles to open our program of poetry and music. Award-winning poet Carol Dine and Holocaust survivor Dr. Anna Ornstein will read new works written by major poets worldwide to honor the seventieth anniversary of the liberation of Auschwitz. Cantor Roy Einhorn will perform Yiddish songs from the Holocaust with piano accompaniment. Join us for a meaningful and memorable event.